bitter sweet stamping: Mini Treat Boxes Galore!! So, do you get the AMAZING A Muse News weekly newsletter?? If not, you can sign up here! It is chock-full of wonderful stamping ideas and information, info on local A Muse classes and all kinds of other fun stuff!! 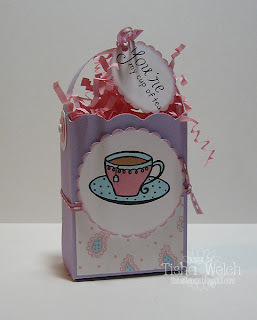 This week, there are templates for making these darling little mini treat boxes out of A Muse note cards! So easy, and so much fun!! This is the 4-bar size with the Kitchen Collection Red Note Card (you can buy them right over here on the A Muse Blog!) I really like all these images from the Valentine's release because you can use them so easily for non-Valentine's day stuff!! I could see using this one for a little boy that does really well on a test or something like that!! My husband and I have a bit of a problem ... with pistachios! I bought a big bag at Sam's and we keep it way too close to where we watch TV!! He'll give me a little look while we are watching something (no, not THAT look!) and I'll get up and grab the bag of nuts!! So, I thought that this would be very appropriate for the love of my life! This was made with the template for the square note cards that can be found in this week's A Muse Newsletter! 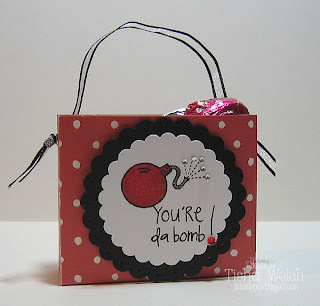 This little box is a variation on the square note card treat box. It is a little taller and more narrow, with a paper handle instead of the ribbons and a cute scalloped top! It would be perfect for some tea bags - I just didn't have any wrapped ones! I am slightly addicted to Celestial Seasonings Sleepytime tea, but they come unwrapped!! Be sure you check out the A Muse Newsletter and go take a gander at the other Mini Treat Box ideas!! Details: All stamps, note cards, patterned paper and bling by A Muse, colored with Copics and Spica Glitter Pens (which you can buy here on the A Muse blog! ), punches by Marvy!! Oh, and one more thing ... I think that the secret to making a good box like this is to use very good double stick tape! I have some that I got through Taylor's blog a while ago, but I also really like the Terrifically Tacky Double Stick Tape!! I totally agree about the tape! Really cute boxes! 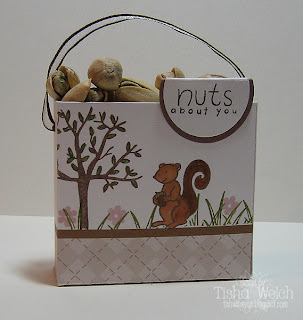 I love the nut box, Tisha...and I share you pistachio addiction! Have you tried pistachio ice cream? YUM!